INESC TEC welcomed a delegation of the Navy Military Staff in July. More than just presenting the institution, the meeting allowed the Navy’s leaders to contact directly with some of the most recent projects developed in the sea area (and beyond). João Claro, President of INESC TEC's Executive Commission, was responsible for the welcoming speech and highlighted that “the sea is a strategic commitment for INESC TEC”, thus being an extremely important area for the multidisciplinarity and manifestation in the institution. In the past, but also for the medium and long-term future. “It is an already existing future”, declared João Claro, who is sure of the advantage, for both sides, of the reinforcement of the collaboration with the Portuguese Navy. It important to remember that in 2011, INESC TEC and the Navy signed a partnership agreement for the development of maritime autonomous systems that can support search and rescue activities in the event of a catastrophe. Vladimiro Miranda, Associate Director of INESC TEC, who is part of the Scientific Board of the Laboratory for Biologic and Chemical Defence of the Portuguese Army made a short trip for the main INESC TEC’s fields of action, identifying some features that have been contributing to the excellence of the institution and that can represent a good role model: “imagination, flexibility and audacity for asking the natural order of things”. 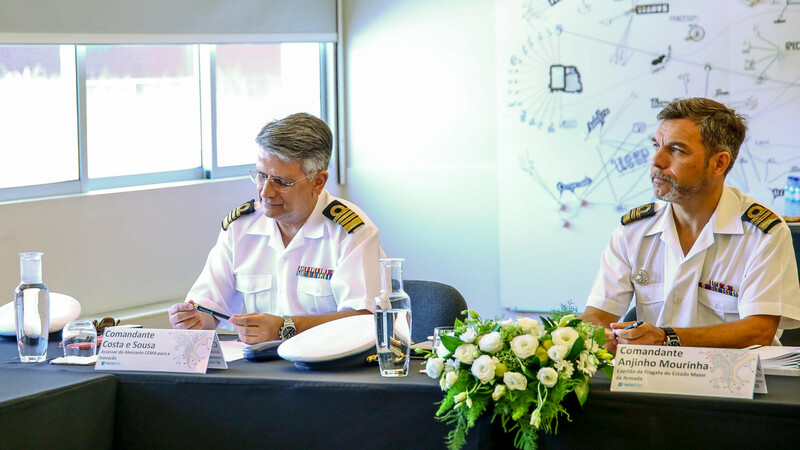 The advisor of the Chief of Staff of the Navy for the Innovation, Commandant Costa e Sousa declared that the visit of the Portuguese Navy to INESC TEC and “everything that we are learning here is of great value”. “The connection that you have between the academia and companies is very interesting and it is something that we want to reproduce for us”, said the representative of the Navy Military Staff. Besides Vladimiro Miranda, João Claro and the Commandant Costa e Sousa, the Commandant Anjinho Mourinha, the Commander of the Navy Military Staff and Victor Lobo, Director of the Navy Research Center were present in the session. The coordinator of the Centre for Robotics and Autonomous Systems (CRAS), Eduardo Silva, the assistant coordinator of CRAS and representative of the Industry Partnership Service, Carlos Pinho, and the researchers Nuno Cruz and José Carlos Alves were representing INESC TEC. From theory to practice, the delegation went to the Centre for Applied Photonics in the pole of the Faculty of Sciences of UP to see the work developed by the researchers of INESC TEC in the area of sensors technology and then went to the Centre for Robotics and Autonomous Systems in ISEP’s pole to get to know the laboratory and several equipments and solutions. At the end, the participation of INESC TEC in the Rapid Environmental Picture (REP) was also discussed. It consists of an annual exercise to test, assess and validate the unmanned autonomous vehicles in operational environments defined according to the specifications of the Portuguese Navy. in the robotic autonomous systems contexts”, but also in a “broad cooperation context”. The researchers mentioned in this news piece are associated with UP-FEUP, P.Porto-ISEP and INESC TEC.